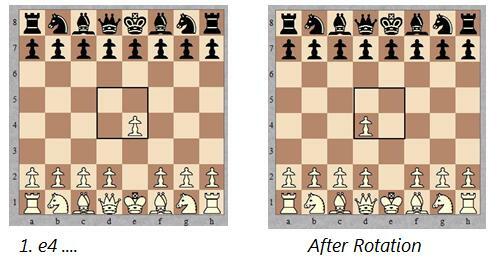 Central Rotational Chess This game is based on a changing board. The original idea was for a larger board having sections of squares which resided on gears which could then be rotated by "Gearmen" pieces. This version being submitted, however, is much more modest and can be played on a normal 8x8 board. A 4-square overlay can be placed over e4-d4-d5-e5 actual boards to make the play easier and greatly minimize the chance of move error. Simply rotate the center piece clockwise after White moves, then again (clockwise) after Black moves. With the rotation aspect aside, all pieces move as do Fide pieces. Check and Checkmate are irrelevant... you win by capturing the King. A 3-move sample game is included in the Notes section. The Pre-Set (which is simply for Chess) is here: /play/pbm/play.php?game%3DCentral+Rotational+Chess%26settings%3DJPG-Alfaerie The pre-set exists due to the aspect of player game ratings. For example, a player rated 1600 at this game, but 1400 at chess... or visa versa. As in Fide Chess. 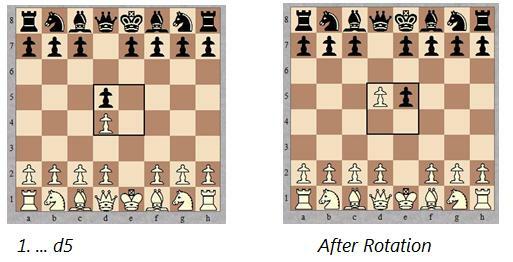 However, due to rotation, a player can end up with 2 light-squared Bishops or 2 dark-squared Bishops early in the game. As in Fide Chess, with these exceptions. 1) Check and Checkmate are irrelevant. Kings can be in Check. Kings can even be in what appears to be Checkmate. They need to be captured. 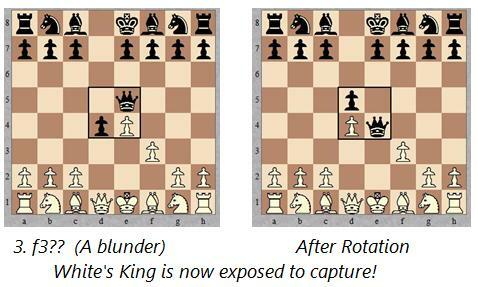 2) Win by capturing the opponent's King. 4. After Black moves rotation happens again. Rotation occurs each time a player finishes a move. This rotation can expose a King to instant attack, causing the King to be captured and thus ending the game. See the sample game in the Notes. Sample Game 1.e4 â€¦ And now the central squares rotate in a clockwise direction such the pawn on e4 will end up on d4. White Plays 1. e4. Now Black Plays 1.... d5 And for move 2 we have: And now White blunders which brings the game to a swift conclusion: And Black simply plays 3. ... QxK and wins the game. Additional Comments: Be very careful. For example: Assume White has a Bishop on e4 and a Queen aligned with it on h7 (as it just captured that pawn). Let's also picture a Black King on h8. In what could be a checkmate here in Fide chess, in this variant Black simply plays KxQ and now the Bishop rotates to d4 and it cannot capture the King. 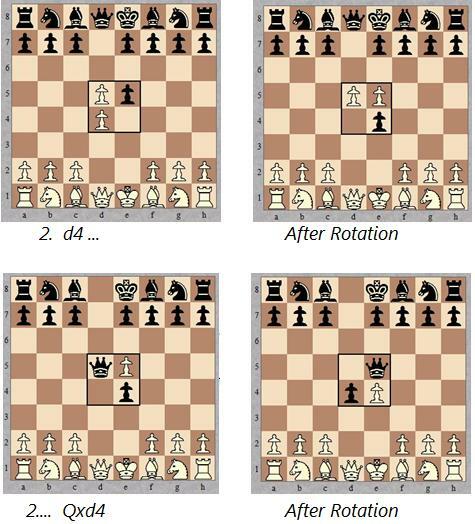 Due to rotation, a player can end up with 2 light-squared Bishops or 2 dark-squared Bishops.